I have had the pleasure of getting to know their staff. My brief review of the site's trails and facilities accessibility is complete. It will inform some changes that will be made even before the gardens' planned major ADA upgrades. Physical accessibility is only one piece of inclusion. The possibilities for systematic development of program and sensory accessibility at the Mendocino Coast Botanical Gardens are inspiring since the collection is so extensive and the terrain so diverse. The capacity and desire on the part of the staff to pursue inclusion is encouraging. Other gardens have established some good practices and I have been wondering what might be some next-generation developments. The Mendocino Coast Botanical Gardens has partnered with the Arts Council of Mendocino County to create a Sculpture Gallery in the Gardens. Their 20101 - 2011 display makes for a complimentary visual, tactile, and in some cases, auditory experience. One piece that included the auditory element was entitled "Beneath the Surface" shown here. 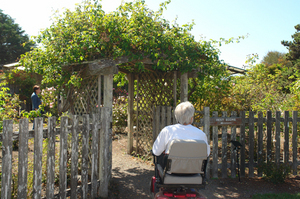 Using the publication below covering the basics of a sensory garden other venues can expand on accessibility. 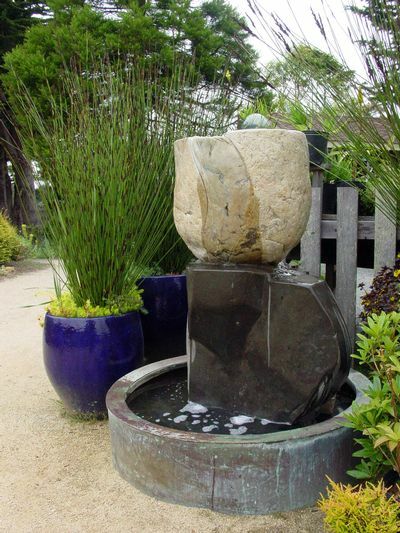 They are likely to be able to draw some new ideas from the Mendocino Coast Botanical Gardens in the near future as well. Bonnie Lewkowicz is founder of Access Northern California, author of the accessibility guide to San Francisco and the book "A Wheelchair Rider's Guide: San Francisco Bay and the Nearby Coast." Her current research on trails accessibility in Northern California has given me an excuse to head out with tape measure, camera, and notebook to explore the region. An estimated 10% of those traveling at any point in time have a disability. These include not only people with visible aids such as wheelchairs or white canes but also many people with disabilities that are not immediately obvious to the unaware observer. Yet "invisible" disabilities, too, can profoundly impact the travel behavior of people who experience them, for example disabilities that affect hearing, speaking, reading, reading social signals, or other communication. The United Nations estimates there are 500 million people with disabilities in the world while a study by Open Doors Organization in 2002 demonstrated that the 42+ million Americans with disabilities spent $13.6 billion annually on travel. How is this market and this cultural phenomenon addressed by the tourism industry? To be considered ecologically sustainable a project must be socially sustainable. That is, it must be realistic in accounting for the human needs and cultural variation among those it impacts. The following questions are meant to stimulate your thinking about how successful you have been in accommodating the diversity of capacities of travelers in ways that make earth-sensitive tourism projects open to all. · Do you provide information in various formats so that it can be independently accessed by users who may or may not be sighted, hearing, English-speaking, literate? · Do you follow best online practices in Universal Design such as W3C WAI or Section 508 (a US web accessibility law) standards? · Does the information you provide include the sort of information that is essential for someone who, for example, uses a wheelchair, travels with a companion animal, or is short of stature , or needs sign language interpreters to participate in certain activities? If not, has that information been collected and made readily accessible for when a traveler requests it from you? · Have you made an attempt to employ persons with disabilities? To seek them out as consultants in product development, marketing, and evaluation? Employ them on an ongoing basis? ? If so, are they only assigned tasks related to disability issues? Or do you also employ workers with disabilities in your mainstream initiatives as well? · If you provide a service to someone without a disability have you designed that service so that it is accessible to all or created an alternate system to accomplish an equivalent result? · Have you implemented the insight, adopted in the LEED (green building) Certification specifications, that building accessibility is a necessity and is an environmentally practice because it extends the functionality of a building for its occupants (i.e. aging-in-place, visitability, lifespan design)? Retrofitting to correct a space that excludes uses more resources and produces waste material. · Are you aware that the Responsible Tourism Movement specifies accessibility for all as central to its definition of responsible tourism? · Did you know that participation in sports, leisure activities, and tourism is a right guaranteed in the UN Convention on the Rights of persons with disabilities (CRPD; see Article 30)? Do you know if the country or countries you operate in are signatories of the CRPD or have similar national legislation and what your legal obligations are under each? · The Global Sustainable Tourism Criteria are part of the response of the tourism community to the global challenges of the United Nations' Millennium Development Goals. Interest in poverty alleviation and environmental sustainability are highlighted in the criteria. How might your work be enhanced by applying the criteria to travelers, employees, and destination residents with disabilities?